Why did Donald Trump fired his Campaign Manager? The New York Times wrote last June: “Mr. Lewandowski had been a lightning rod for controversy, making headlines about himself that overshadowed his boss.” It turned out that one of the reasons Donald Trump fired his campaign manager, Corey Lewandowski, have that he never before worked on a National race. Undoubtedly, Mr. Lewandowski did a great job helping Trump “getting more votes than anyone else has ever gotten, a record turnout in 45 out of the 50 states, record low expenditures” the senior Trump campaign adviser, Mr. Bennett said. In World War II, Dwight D. Eisenhower was the commander in chief. To train his generals, he would take a chain and stack it up on his table and would ask his troops “If I push the chain, where would it go?” They didn’t have the answer. The correct answer is: you really don’t know. If he took the chain and picked it up and pull it up by the end, the answer: is the chain will follow. This is the essence of leadership. If you push the people, down deep inside, you really don’t know where they will go or what they are thinking. But if you can lead them and have them follow you, then you have the skills of a leader. By yelling or telling people what to do, you’re really not sure which way they will go. However, by showing them how to do it, they listen. Jump in the trenches with your employees and help them. That’s leadership. Power comes when the people you are leading give you their support. When that support comes to you, that’s power. Employees take that power and watch you. When you take that power and give it back to them they give you more. But if you start to take back some of this power, employees start giving you less. Leaders that are falling are those who take back the power and does not give it back to the people they are leading. It’s not any kind of leadership. It’s that leadership with no ego. The one that takes nothing but give it all back. You need to be in touch with the people you lead. You need to be in their shoes. 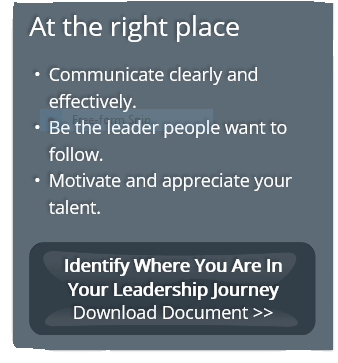 To find out where you stand in your leadership journey, download this document.